Wow, I just experience my first bidding war! What a rush! Mama has had a few dozen in her career but it was a whole new experience for the Budster. Nicholas and I went with Mama last Thursday to put the lockbox on our new listing at 48 Aunt Sades Lane off Route 845 on Long Reach. We don’t usually get to do that but Mama had been working some crazy hours and knew we’d enjoy the drive in the country and the ride across the Gondola Point Ferry. I had no idea how hot it was going to be but I wasn’t long finding out. The next day I featured it along with my new pics on my blog and on Saturday it was my choice for “Buddy’s Best” advertisement in the Real Estate Guide. Then away it went, the calls started coming in and the buyers were all over it! Mama was busy booking the showings and spacing them far enough apart that the buyers wouldn’t be bumping into each other. Mama, Steven and Jody all had interested parties as well as three other agents. Sunday night the first call came in that an offer would be written and Monday morning everything went into high gear and the offers started flying in!!! I’ve known the owner of the property since I was a just a puppy so when she arrived at our place at one o’clock on Monday I don’t know who was more excited her or I! Of course Nicholas was his foolish self, giving her kisses and spinning around the foyer which made her laugh and took a bit of the tension out. I have to say these bidding wars are a bit nerve racking when you’re not use to them. It was a first for me and a first for her. Good thing Mama is experienced and got us all calmed down. The lady sat at the table and reviewed each offer with Mama carefully weighing the pros and cons of each one. I sat right with her letting her know that she had my support. She kept gently rubbing my head and I could tell it was keeping her calm and focused. Two of the bids were over asking price which was so nice to see in the middle of a recession. Of course she took the best one with the highest price and the least amount of conditions. She was extremely happy and so were we! It couldn’t have happened for a nicer person. The closing is quick and the process was painless! Tuesday evening, once again we jumped in the SUV and headed for 48 Aunt Sades Lane on another warm sunny evening. This time Papa came along for the drive and Mama posted the SOLD sign and removed the lock box. Then Nicholas and I were in for a big surprise. Mama told us that she had permission from the owner for the two of us to go for a “Celebration Swim” in honour of all our hard work on the bidding war! Off we flew, down to the beach and right into the river! Nicholas of course did a big dive; he’s such a show off, while I cruised up and down the shoreline just out over my head. When Mama says that I float like a boat it’s no joke, I do! Then low and behold who jumps in with us but Mama! She doesn’t get in with us much at New River Beach (just to her knees) as she says the waters too cold but the water is warm in the St. John River, just like a bath tub. She headed right for me with long sure strokes and the three of us totally enjoyed a refreshing swim. Me being a Newfoundland dog I kept a really close eye on her. If she showed any sign of needing help I was ready to pull her to shore. Nicholas and I had a real ball swimming with Mama. Papa was a chicken; he didn’t come in but just laughed and watched us from the shore. I have to say that my first bidding war was one of my best and most memorable experiences in real estate to date but as Mama says in this business you never know what’s just around the corner! We just can’t hold Steven down! 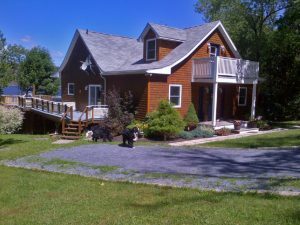 He’s having a special open house this New Brunswick Day Weekend on Saturday from 11am to 2pm at 868 Route 845 in Kingston, just around the corner from the Kingston Farmers Market. This quality Queen built home is nestled in the picturesque Kingston in a park-like setting on 28 acres with a pond, babbling brook & meandering walking trails. It is in mint condition and has a huge wrap-around covered veranda. This is country living at its best! How much fun could Nicholas and the Budster have on 28 acres??? I love this farmers market and this house is so close by, drop in to say hello to Steven while you’re there, he’s always happy to see you. 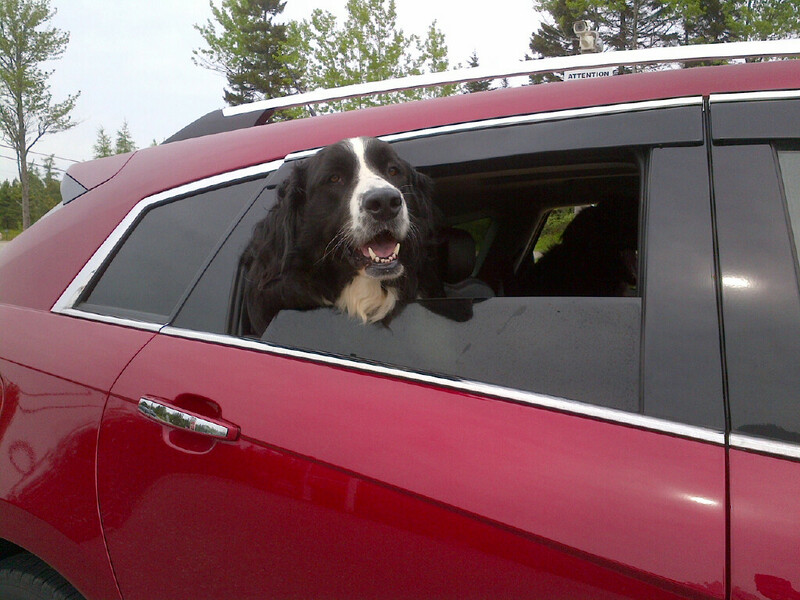 Have a fun and relaxing New Brunswick Day weekend! Nicholas and I plan on being a pair of beach bums. If you see us come over to say hello but don’t be surprised if you get a kiss from Nicholas. Loving this warm sunny weather and the real estate market is getting hotter by the moment! The entire team has been busier than bees and that includes me and Nicholas as well. Mama listed a wonderful place on Long Reach with a nice Sandy Beach and a heated pool! 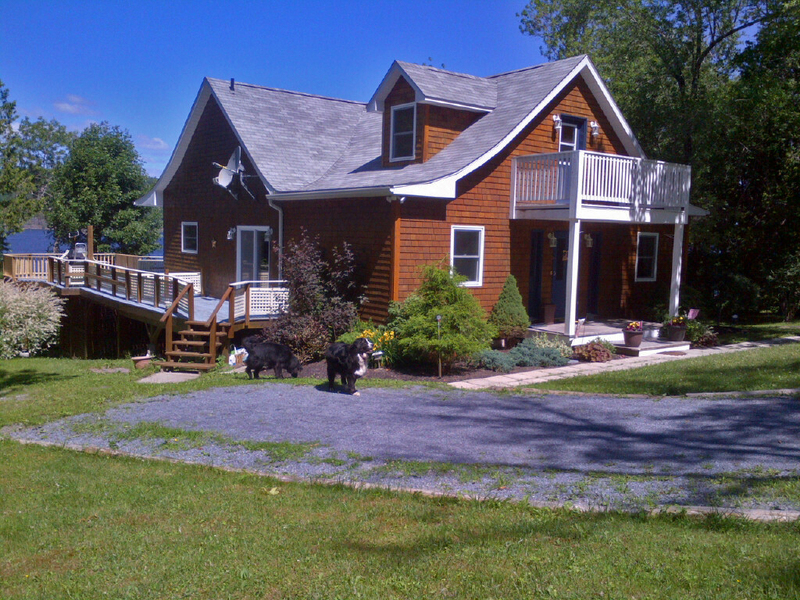 It has a one-owner cedar house as well but it’s the waterfront that really gets Buddy Bacon’s engine revving! We drove over with Mama while she installed the lockbox and checked it out first hand for ourselves. Whoa Bessy, the fun we could have here. I tried to sneak down to the water but Mama caught me and said no swimming on the job! (Nice try though, ha, ha.) Features huge deck, heat pump with A/C, finished walkout basement and it comes totally furnished with dishes, pots, pans, new towels & sheets, etc.! Just grab your overnight bag and you’re in! Here are a few pics we took while we there. Both Steven and Jody have listed several properties this week and have been negotiating numerous offers with several coming cleanly together. So exciting for the team, our sellers and our buyers! Now for the inspections and the due diligence; a lot of hard work. Really glad Nicholas and I aren’t involved in that aspect of the sales because it’s way over our heads! Good thing we have the experts to be sure all i’s are dotted and all T are crossed. The entire team has had more showings on properties this past two weeks than we’ve seen in a while, helping buyers find just the right property. If there are two words we love to say in our company it’s “Welcome Home”! Mama was out late yesterday listing a stunning upscale home that she is very excited about. 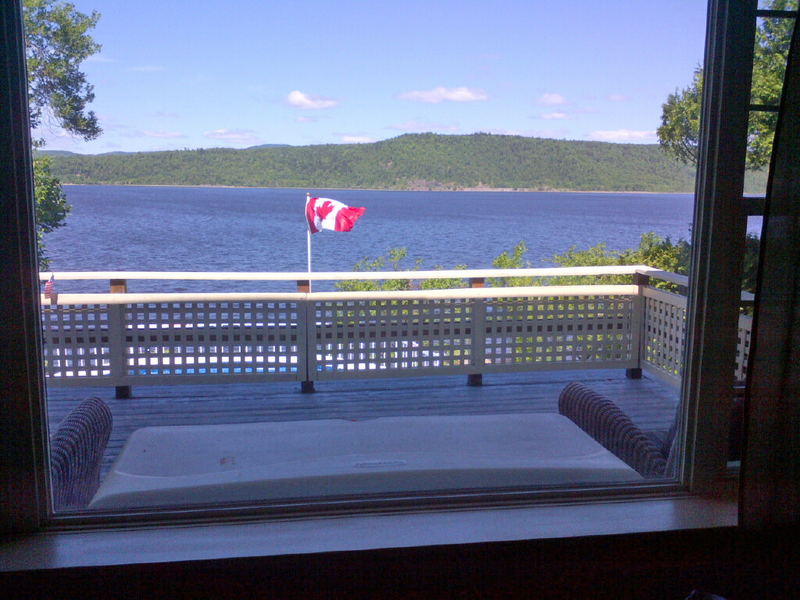 It’s on 1 ¼ acres and has a stunning panoramic sunset view of the Kennebecasis River. She says the lady has impeccable taste and could have easily worked as a designer if she had chosen. The interior looks like something right out of a magazine! Looks like a fabulous big flat yard for Nicholas and I to play in!!! Steven is hosting two open houses this weekend. The one on Saturday is from 2-4pm at 21 Upper Deck Lane. We’ve sold #23 Upper Deck Lane which is being custom finished so if you have a chance check out these large waterfront condos. On Sunday from 2-4pm he is hosting a stunning home and very private property at 924 Main Street in Hampton. This lady is certainly no slouch when it comes to decorating either and this may very well be the prettiest home in Hampton. It has a huge fenced yard to keep out the deer and a large deck with glass rails so the beautiful view is not obscured. 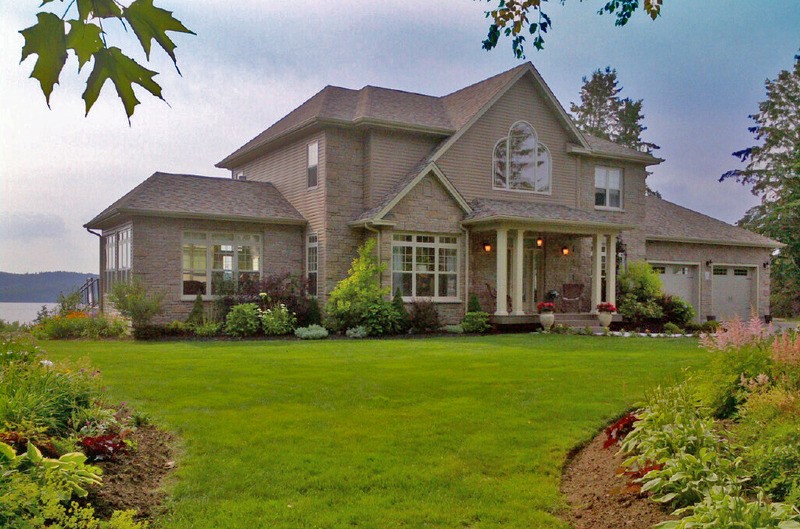 This is a home that I featured as one of my picks in my “Buddy’s Best” ad in the Real Estate Guide. Drop by for a look and you’ll see why! This coming Wednesday evening July 27th from 6 to 8pm Team Platinum is hosting a Fine Homes International™ Twilight Open House in the heart of Rothesay at three phenomenal properties! These will include 6 Grove Avenue on 1.17 acres priced at $1,175,000, 3105 Rothesay Road on 1.5 acres priced at $989,000 and 3189 Rothesay Road on 2 Acres priced at $875,000. View the details and pictures of these properties on our web site under Listings and Open Houses. Mama, Steven and Jody are hosting. Come for a rare view behind the hedges of these striking estates showcasing the splendour of yester-year with all the creature comforts of today including estate-size lots large enough for Big Buddy Bacon and any four-legged friends, children or grandchildren to romp and play! Have a great weekend! Watch for Nicholas and I out and about Southern New Brunswick and be sure to say hello if you see us! We love meeting new people. More and more I become an integral part of the Team as clients request inclusion in my ‘Buddy’s Best’ advertising in the Real Estate Guide and in my blog. Makes me so happy when they say, “Please include us in Buddy’s marketing”. I work hard at it and it’s good to know that I’m appreciated. Mama was busy with a bidding war earlier this week, two nice new listings and offers on two of our high end waterfront properties which she is still negotiating on. Steven and Jody are always busy and part of that includes three new listings for them as well which I’ll be giving you more details on. Mama listed a spectacular heritage home at 297 Douglas Avenue with the most ornate detail and custom mill work she has ever seen! 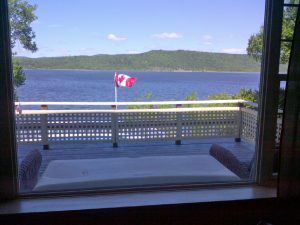 Beautiful view of the St. John River and a wonderful park right next door which separates this home from the old museum. The fun Nicholas and I could have in that park!!! She also listed a lovely 4-bedroom, cedar, year-round cottage on Long Reach at 48 Aunt Sades Lane off route 845 with a nice sandy beach, great boating and swimming. Our brothers Theodore and Laddie use to swim here with Mama and her friend so she can vouch for the good swimming. Nicholas and I are going to check it out for ourselves so we’ll keep you posted on that. Steven is hosting an open house at a great waterfront year-round cottage on the Washademoak Lake at Belyea’s Cove at 30 Centennial Drive. The cottage is on 1.2 acres, comes completely furnished with modern appliances and a heat pump for refreshing air conditioning (very important to the Budster). 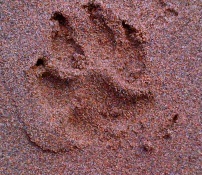 Beautiful big sandy beach my favourite thing in the whole world! 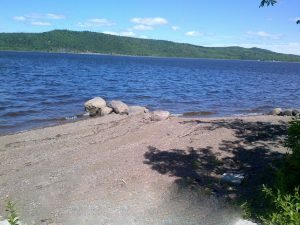 Good for boating, bon fires and best of all swimming, swimming and more swimming. God gave me these big webbed feet for a reason and I certainly like to use them! Enjoy the sunshine all weekend and I’ll be talking with you soon. Wow what a week! Mama was busy as a bee and out of the house a lot with showings, listings and business meetings so Nicholas and I were with Papa more than usual. That’s okay; we just love spending time with Papa. He is sooo much fun and likes playing games with us. We like to hang out with him while he works around the yard, he says we are a big help! I’m looking forward to a few good swims at New River Beach this weekend. It’s not supposed to be sunny but that’s okay with me. As long as it’s not raining Mama will take us down for some swim time. Saturday is supposed to be overcast with the sun peeking out a bit mid-afternoon and that’s good enough for Big Buddy Bacon to hit the sand! Nicholas will be tearing around the beach, chasing the ball and finding the biggest tree branch he can find and dragging it to the sea shore. We’ve seen him drag branches that are six inches in diameter and twelve feet long. He’s one strong boy. I’ll try to get some pics of it to show you in future blogs. We won’t be down there Sunday as it’s supposed to rain really hard, no fun for the Big Bud and Nicholas just hates to get wet! The Team has several open houses this weekend. Saturday between 2-4 pm Steven is at 33 Deveber Terrace in Millidgeville which just had a recent price drop! This house is mint with modern features and a lovely back yard. Sunday from 1 -3 pm he is at 1217 Route 865, Cassidy Lake off Route 111. 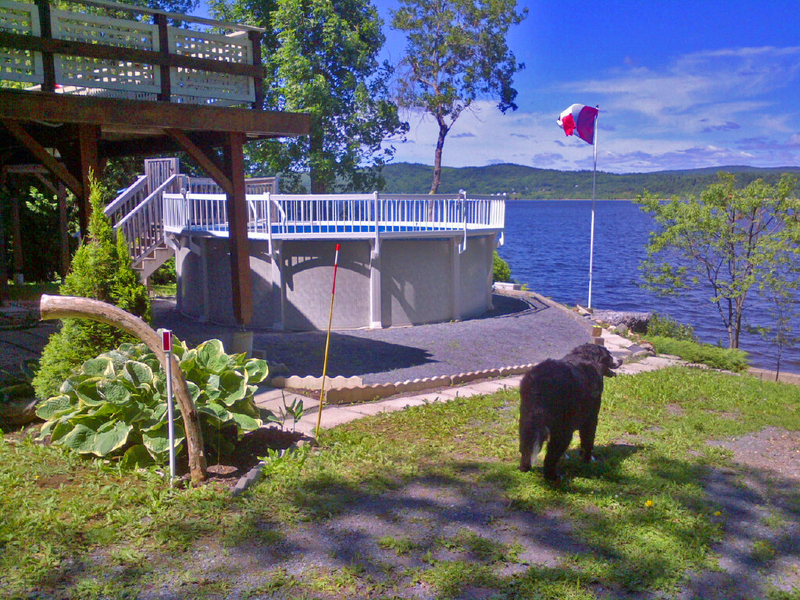 This waterfront one-level ranch-style home has 100 feet of sandy beach on Cassidy Lake! Sounds like Buddy’s kind of property! Also Sunday from 2-4 pm Jody is hosting an open house at 16 Antler Crescent, Quispamsis off Vincent Road. This one-level home is in beautiful condition, very modern with open concept and water view from the covered deck! Hope to see you there.